1. Traditions don’t have to be traditions for life. They can be traditions for a season. Friday night has always been family pizza night. Usually I make it at home. In the United States it’s much cheaper to make at home and tastes much better (certainly less salty than any restaurant or frozen variety!). Not so in Romania. The tradition of homemade pizza, all the family involved, is on hold. There are four pizza places in town that bake Naples style pizza in brick stone ovens heated with real wood – for an average of $5 a pizza. They even deliver for free. What’s not to love? One day, when I have my pizza stone, rolling pin and a flat counter again, the family tradition will recommence. There’s no shame in a family tradition hiatus. 2. We have endured many long seasons of separation in our family. I didn’t expect that life experience to be so relevant in Romania. This month we covered over 1,000 kilometers of Romania by road. The unspoiled beauty and simplicity of rural Romania has a dark side. Romania, a member of the EU, does not have enough jobs for its citizens. Millions of Romanians live abroad, mostly in other EU countries, the United States and Canada. These working age adults leave behind children and spouses, often to work low-wage jobs, for months or even years before returning to visit. This months I met an older couple whose daughters lived abroad. One daughter had an elementary school-aged son who she only saw once a year. Her son was being raised by her parents on their small, subsistence farm. Their village was full of families like theirs. I haven’t met my neighbor’s husband because he works in Italy 8 months of the year. When he returns, they are home together for one month and then she leaves for several months. They do this every year. No family is untouched by periods of long separation, forced upon them by the depressed economy and complete lack of jobs for the educated and uneducated alike in this region of the country. Our family has gone through many periods of long separation and we anticipate more in the future. I can empathize with my neighbors and I understand the difficulties of raising children without a present spouse or other family members close by. When an entire country is marked by broken homes and family separations, it wreaks havoc on the social structure, particularly the children. I will write more about this in the future. 3. Being comfortable with spontaneity will lead to the most memorable and blessed experiences. When we arrived at the ancient Roman ruins, a construction worker pulled out his cellphone and hurriedly explained some inglezas had arrived. A few minutes later a Romanian woman arrived to show us around the fortress – unguarded, open to any wanderer, pieces of pottery and ancient pillar fragments and all. [More about the fortress at Corabia in an upcoming post]. After our tour, she explained she had just put bread in to bake before she came to meet us. Would we like to come see her home and have some fresh bread? Absolutely! Unless there are extenuating circumstances, we have learned to take up strangers on offers of hospitality. We learned this woman was a widow. Her husband died of cancer twelve years previously and her daughter lived in Bucharest. She lived off the land surrounding her large mid-century home. 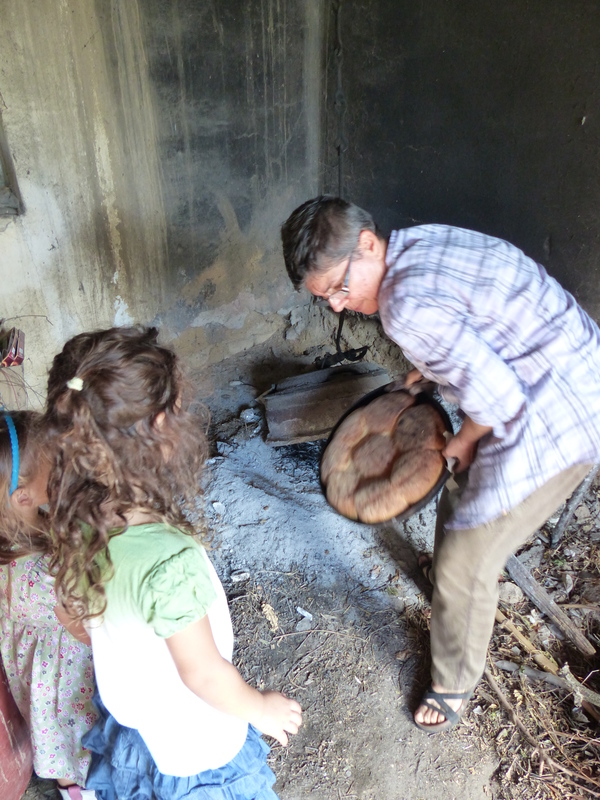 She gave us a tour of the garden and we watched her scrape the coals off her ‘oven’ and remove the pan of smoked bread from the ashes. She showed us family pictures, shared her life story and was thrilled to have new faces to whom she could offer hospitality and share her organic bounty. We were overwhelmed. Before we parted, she gave the girls earrings, we exchanged phone numbers and she invited us to visit any time. We will definitely stop by next time we’re in town. 4. Few things are more gratifying that a new pair of rain boots. On Wednesday I bought my long overdue first pair of rain boots at the central market in town. With new five dollar blue wellies and one dollar insoles, no more will I dampen my normal shoes when I walk through the grass to the car while evading mud puddles (we live on an unpaved road). No more will I dread walking the plum orchard in our yard after the rain, searching for doggy presents so the children can play without risk of stepping on stinky mines. Additionally, rain boots easily slip on and off, very important when culture and practicality require shoes be taken off when entering a home, including our own. Next week I look forward to purchasing a pair of boot cuffs, the newest soon-to-be-realeased offering from local Romanian outfit Spero Designs. 5. A toddler in diapers with easy access to the plum orchard makes for one month of the most atrocious diapers. Did I mention we live on a small plum orchard? The kids climb the trees, frolic in the grass and eat plums all day. Sounds idyllic, I know. The Romanian word from plum is prune. And that’s what my son’s diapers looked like most of September. I can’t even describe the smell. Up to seven times a day the laxative fruit did its work in his pampers (the Romanian word for diapers). Too much information? This is simply a service announcement for readers with toddlers who might be considering moving to a plum orchard. I’m sure there are some of you out there. Before we came to Romania, I met so many people who said they had been here at one time or another, some right after the fall of communism. Many people talk about the children. Others mention the hospitality, which I also discuss in the blog post. ALL of them had fond memories. It’s that kind of country. . . I am so delighted to have found your blog. We’ve lived in two cities – Geneva and Stockholm – with Roma populations, and it has broken our hearts time and time again. I’m an expat mom as well, by the way, and so many things you’ve written here have made me smile. It’s always fun to connect with other women who live in Europe (although I’m only here for a few more weeks). Yes, expat moms sure can relate to one another! The Roma, or gypsies as most people know them, have a large representation in this part of Romania. In fact, there are quite a few gypsy homes in my neighborhood – large homes with turrets and decorative tin roofs. I intend to post pictures and blog about them in the near future. Many tragic stories surround them, but also many stories of triumph and victory. Love the items offered by Spero! Currently living in a country with severe import restrictions, but I’ve saved their shop as a favorite so I can go back and buy something in the future. Kim, Thanks for checking them out. Spero was started by a Romanian woman who wanted to help poor woman learn a craft and bring in an income so they didn’t have to leave the country (and their children) to work a low-wage job abroad (VERY common here). It’s just starting up and they’ve had some successes and encouragement already. Thank you for your support! Previous Post Who is on the front line of the refugee crisis?